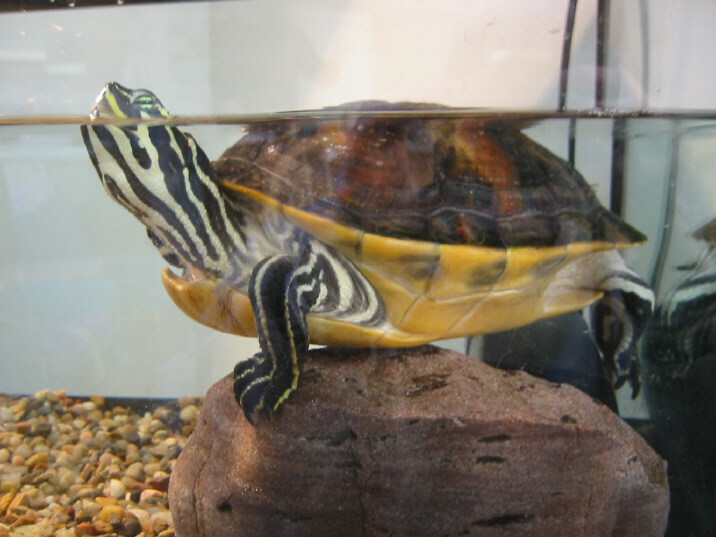 Information on aquatic turtle care and turtle ponds can be found at my main turtle page. Note: There is a lot of conflicting information here on scientific names, clutch sizes, etc. because each and every source that I discover on turtles has a different answer to these questions. All of the following information comes from turtle books and web sites. 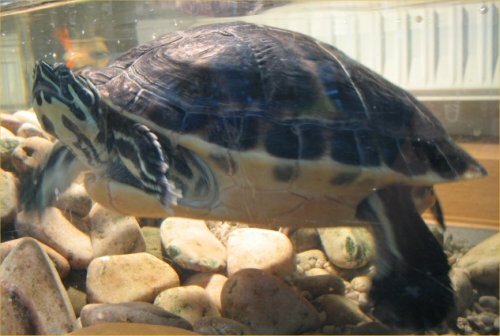 A good site for identification, photos, and information of native USA turtles is enature. com. There are 46 species of North American freshwater turtles. Most are in danger due to habitat loss, capture for the pet trade in the US and other countries, capture for meat (mostly for sale in other countries), predators like raccoons, and vehicles. I will only mention a few species here. Not all are suitable for outdoor ponds. Any of them could be kept in outdoor enclosures year round if they were obtained legally, were provided with appropriate habitat, were protected in all directions from predators, and existed naturally in a similar climate as your own. The bog turtle is Clemmys muhlenbergi . These little turtles are very rare and endangered. Bog turtles are the smallest North American turtle at 3 to 4.5 inches long. They eat small insects, worms, and spiders. Because they live in marshes that developers destroy daily, their future as a species is in peril. Illegal collectors also take their toll. They are known for a yellow or orange blotch on each side of the head. It is illegal to buy, sell, harm, or possess a bog turtle. 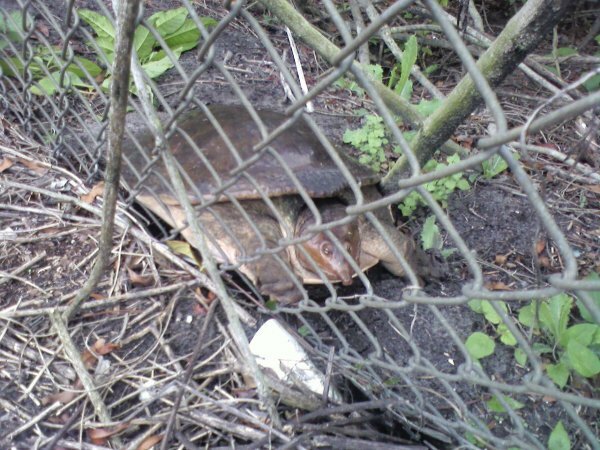 John, from one of the US state's DNR's, sent this photo of a chicken turtle on 4/9/05. He said that the turtle that I thought was a chicken turtle was in fact a cooter. See below under cooters for those photos. 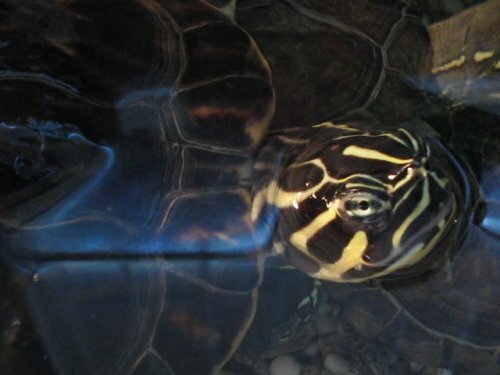 The chicken turtle, Deirochelys reticularia , has a lot of yellow on it. 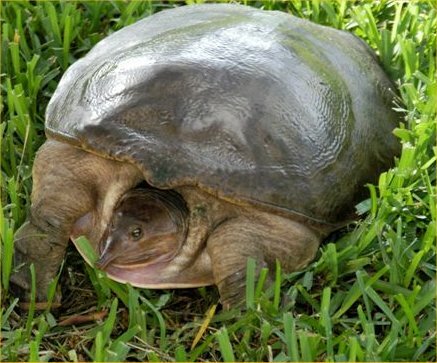 This turtle, found most often in Florida and other Southern US states, grows to only 5 to 10 inches in length. 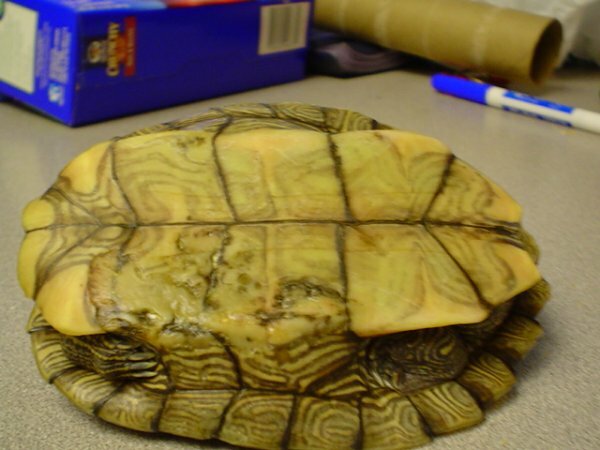 Here is the enature.com page on the chicken turtle. I do not know much about these turtles but have added it here as a few people have asked for its identification. Cooters belong to the genus Pseudemys . Two species are Pseudemys concinna and P. floridana . They mostly eat plants so would not be welcome in ponds with plants. A koi pond without plants would work well with cooters. Cooters are known for their friendliness. Most are not winter hardy. They grow 6 to 16 inches long. Red-bellied turtles are also cooters. See the section below for more on them. 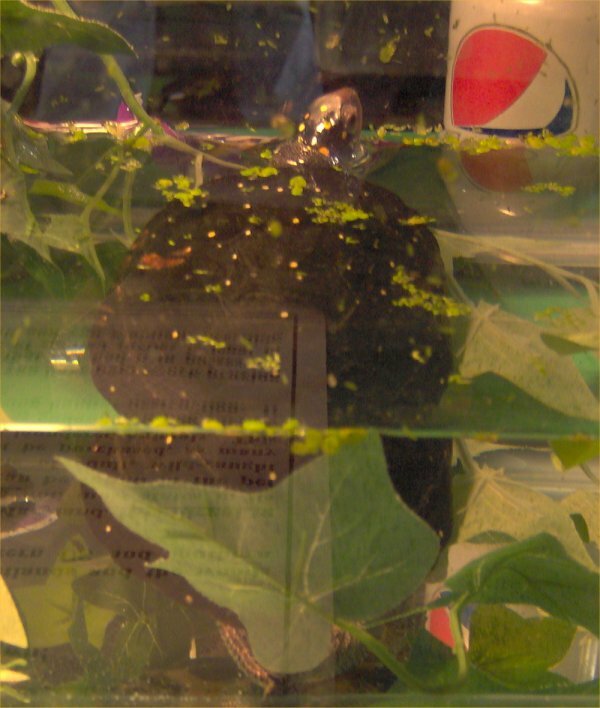 Mimsy sent three photos of a turtle for identification on 10/3/04. 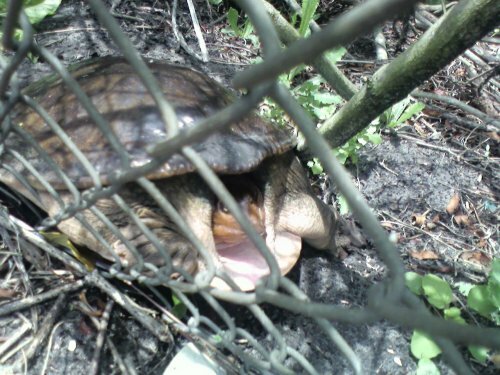 I thought it was a chicken turtle and originally put it under that section but John told me on 4/7/05 that it is definitely not and appears to be a cooter. Mike confirmed on 6/20/06 that the turtle is definitely a cooter, a Peninsula cooter ( Pseudemys peninsularia or Chrysemys floridana peninsularia ). 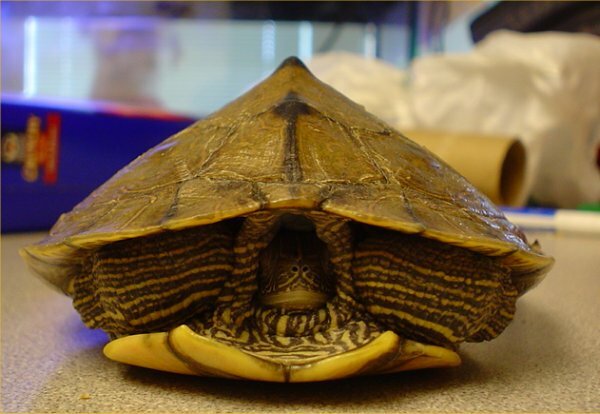 Here are the top view, head view, and side view of the presumed cooter. Mimsy thinks the turtle is male. Randy sent me a bunch of photos of his Peninsula cooter which you can see on Randy's page. 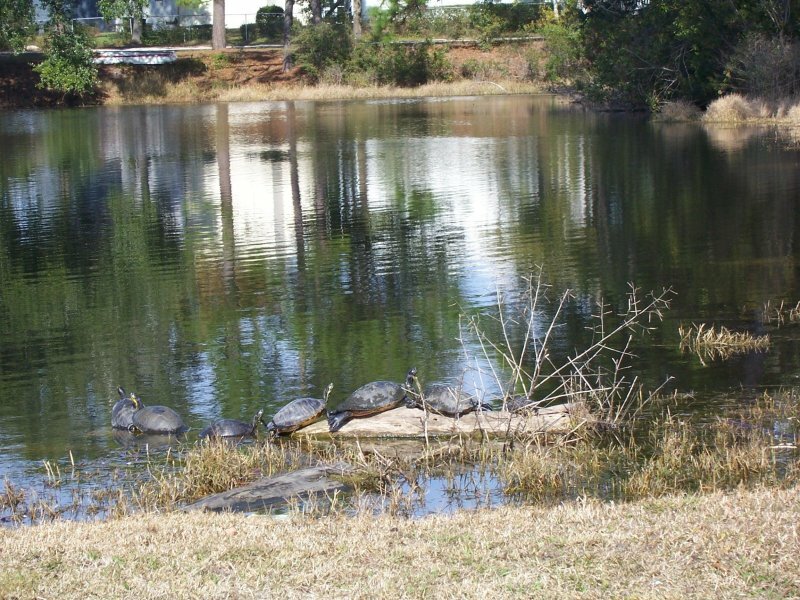 On 1/29/08, Greg sent this photo of some huge turtles sunbathing in Florida. We think they may be Peninsula cooters. On 8/28/08, Crystal sent this photo of a baby turtle. She thinks it is a Peninsula cooter. 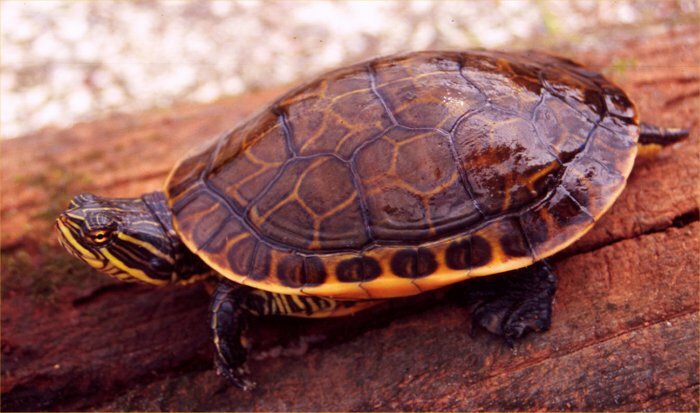 There are nine North American species of map turtles and sawbacks belonging to the genus Graptemys . They are shy turtles that like to bask. Most eat mussels, snails, and insects. They rarely eat plants so they could live in a pond with plants and large fish just fine. They will take other small animals if these are not available. Their carapace grows 9 to 10 inches long. 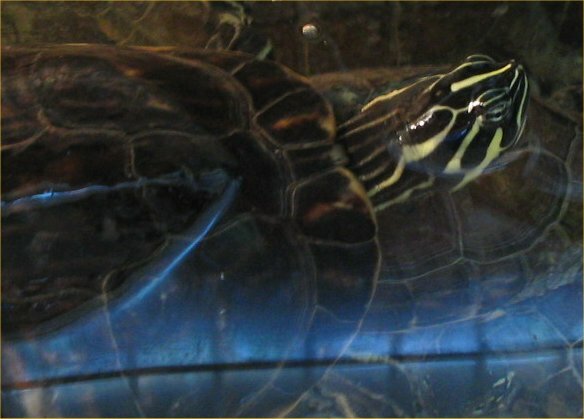 The false map turtle is Graptemys pseudogeographica . 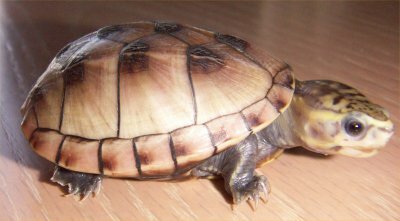 Another map turtle is Graptemys geographica which grows 4 to 6 inches long. 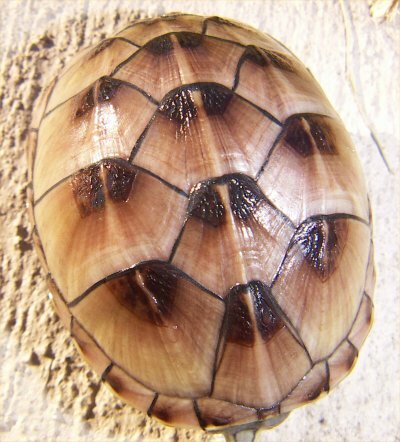 Map turtles are named for their intricate shells. Sawbacks have knobby projections on their carapace. 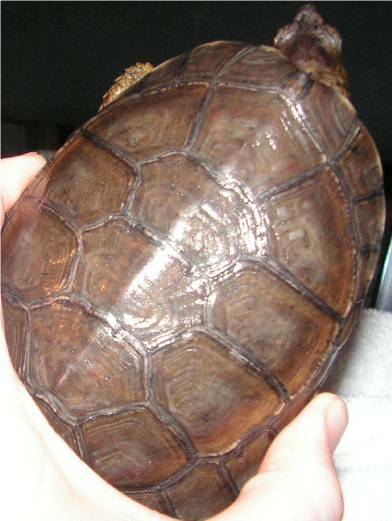 Map turtles and sawbacks are shy and live in large rivers and lakes. Females grow up to a foot long with males half as big. Their jaws are strong to crack open snails and mussels but they eat soft bodied insects and other animals too. 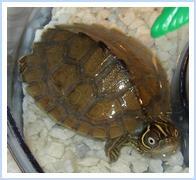 Randy sent me a bunch of photos of his Mississippi map turtle which you can see on Randy's page. 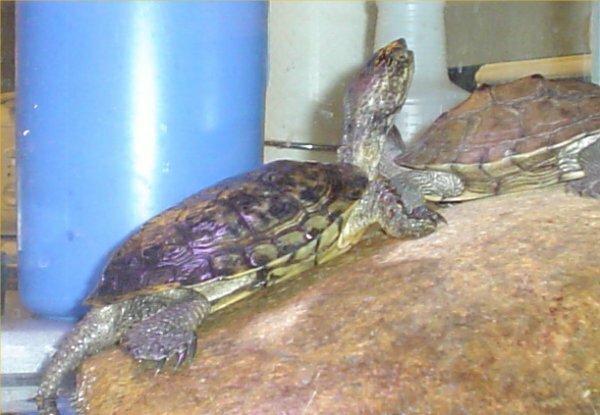 Sarah (I assume not the Sarah below) sent a lot of pictures of her baby map turtle in March 2007 which you can see on the hatchling turtle photo page. Justin sent these photos on 1/2/07 for identification. I think it is a map turtle but am not sure which specific species. 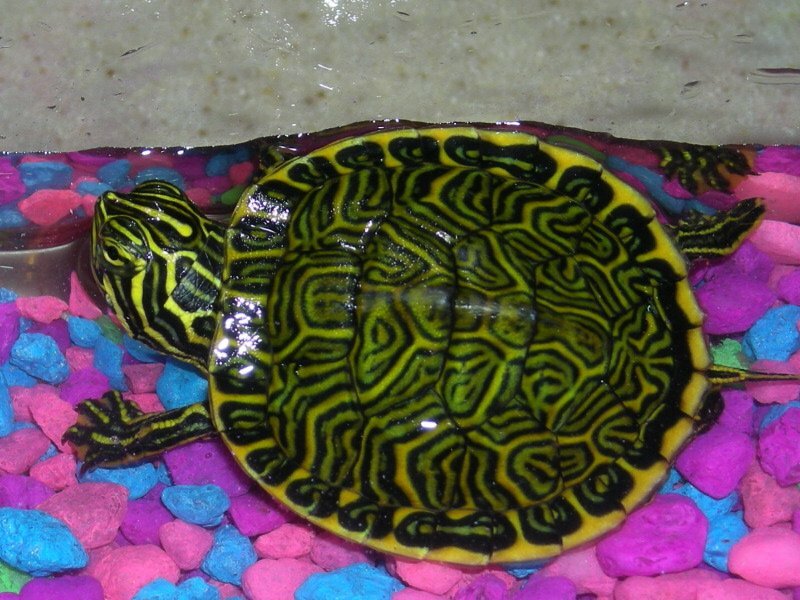 Map turtle - top view. Map turtle - side view. 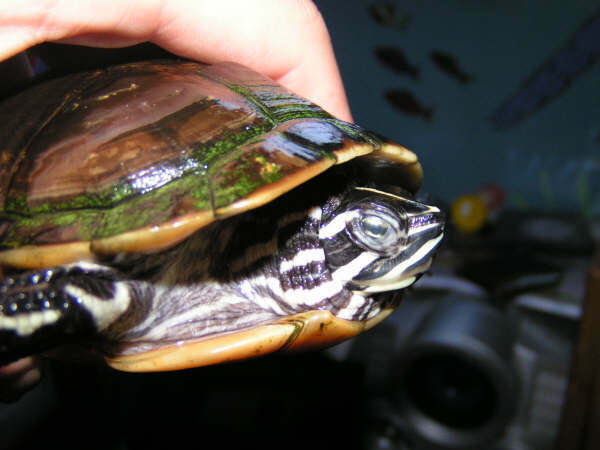 Map turtle - front view. 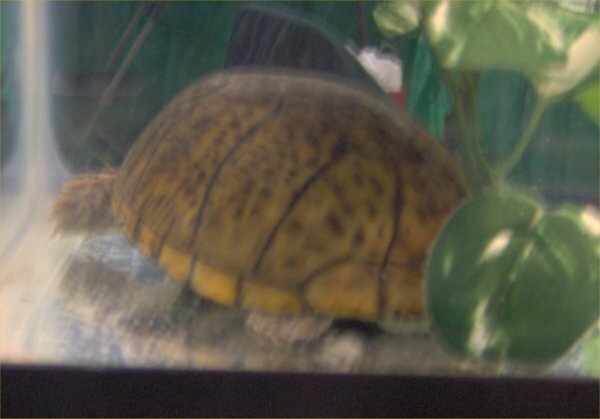 Map turtle - bottom view. The plastron sustained some sort of damage when at the previous owner. Map turtle - side view. 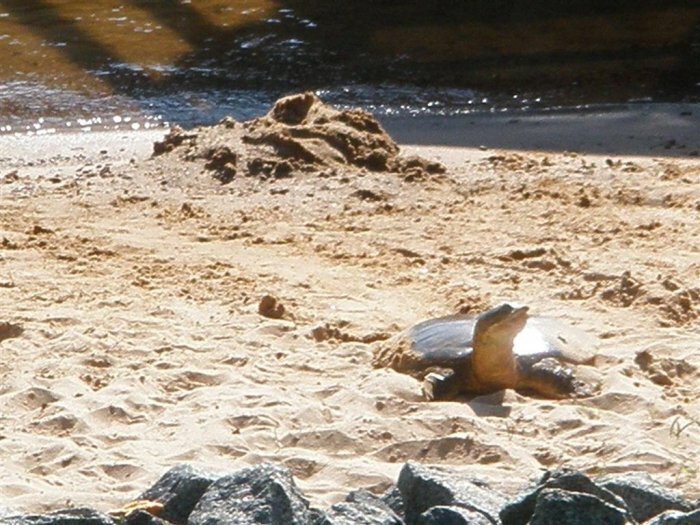 The larger turtle on the left is a Western pond turtle (see under that section for photos he sent of it at the same time). Map turtle on the far upper left along with a hatchling RES and a painted turtle on the right. There are five species of mud turtles in North America according to one source I have (but the site below lists dozens!). They can pull their head and limbs into their shell. Mud turtles eat insects and small animals. 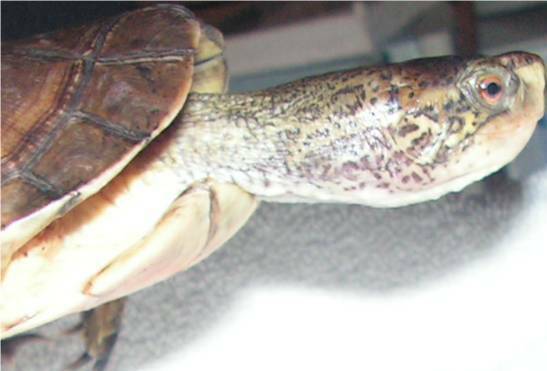 The Eastern mud turtle is most common. They grow to about 3 to 6 inches. Breeding takes place in early spring with egg laying of one to six eggs in June in most cases. 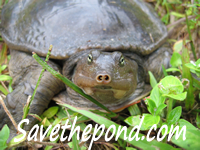 Here is a link to a site with photos of various mud turtle species. 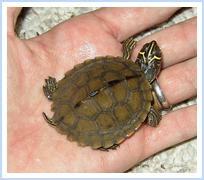 To see eight photos of two baby yellow mud turtles, see my baby turtle photo page. 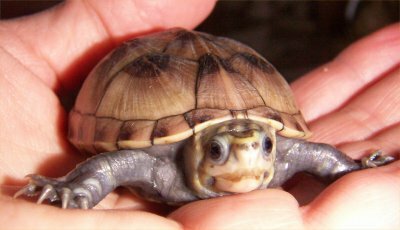 To see four photos of a baby striped mud turtle, go to my baby turtle photo page. 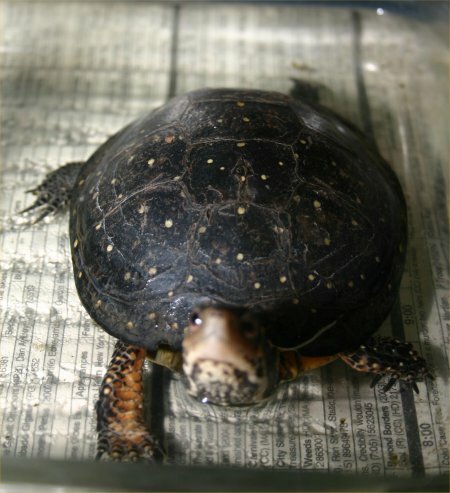 The common musk turtle is called the stinkpot. Sternotherus odoratus says it all since the word odor is in their Latin name. 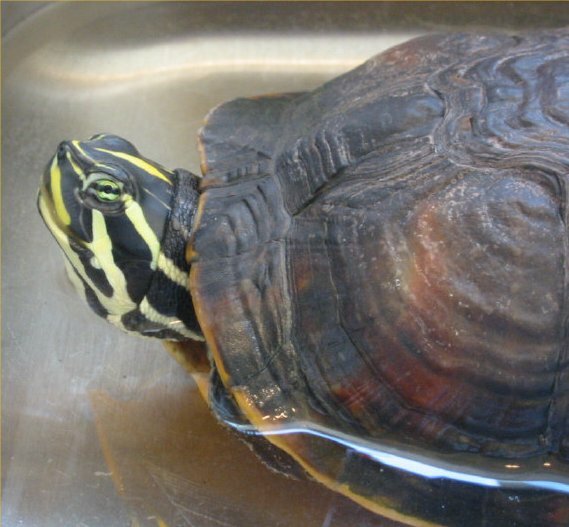 As you can guess, this turtle discharges a stinky yellow fluid when pestered. They are also prone to biting. If you do not upset them, they make good pets (like skunks!). They are highly aquatic (rarely leave the water) and eat snails, insects, and crayfish. Growing to 3 to 5.5 inches long, they have big heads (the better to bite you with). 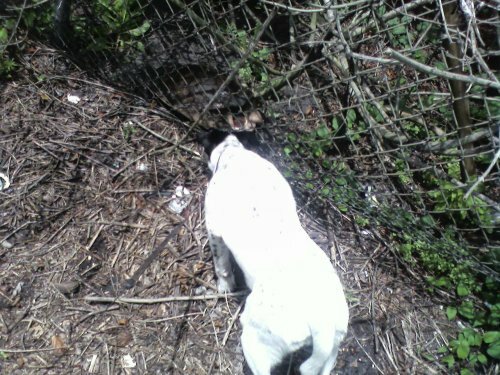 Stinkpot'"s like mud bottoms in their ponds. They mate underwater and lay one to nine eggs in the spring which hatch in 9-12 weeks. See my baby turtle photo page for a few possible stinkpot photos. 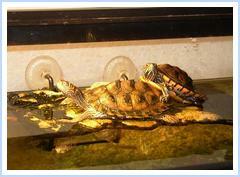 Haywood sent some photos of his musk turtles and their tanks. Go here to see photos. 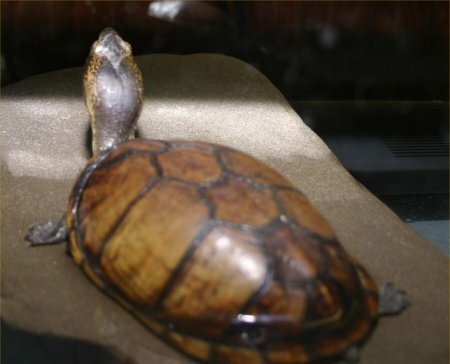 The Eastern red-bellied turtle has multiple names: redbelly turtle, red-belly turtle, red belly turtle, red bellied turtle, red-bellied turtle, and replace the "turtle" with cooter and maybe slider to get 10 more options! There is however only one scientific name, Pseudemys rubriventris or previously Chyrsemys rubriventris . I am unclear if they are by themselves, cooters, or sliders but Pseudemys indicates cooter. Red-bellied turtles have well, red bellies! 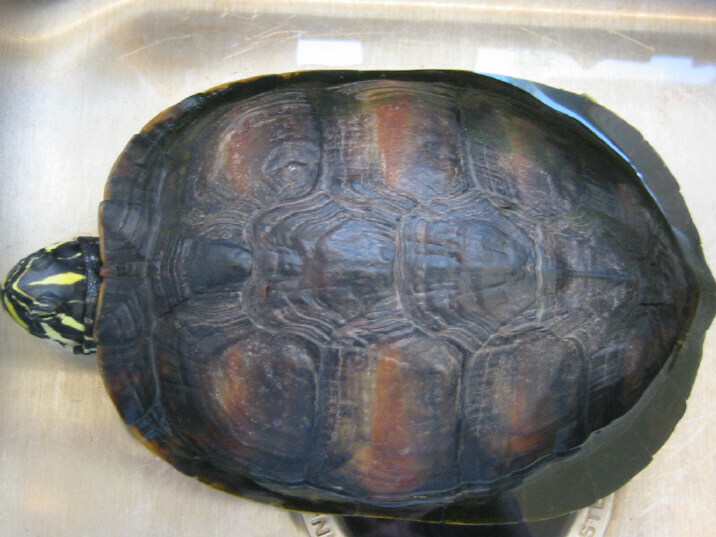 The Western painted turtle also has a red plastron but there are slight variations. At least one site says that there are no red-bellied sliders but people often call these cooters sliders. Red-bellies eat both plants and animals with more plants as adults. They will eat the usual turtle fare of fish, worms, insect larvae, tadpoles, crayfish, and of course, plants. These guys like deep water. 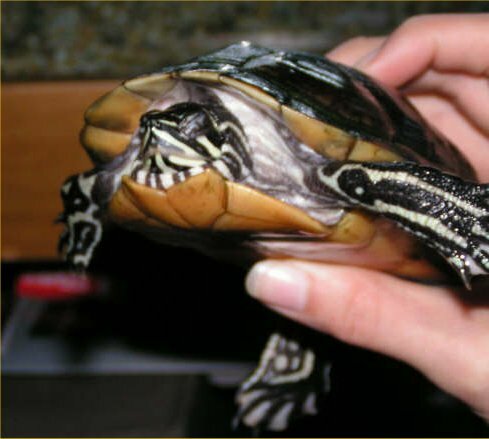 While they can be common if parts of the Eastern USA, there are a few endangered subspecies such as one called the Plymouth red-bellied turtle. There are many subspecies with perhaps the Florida redbelly been most commonly known. 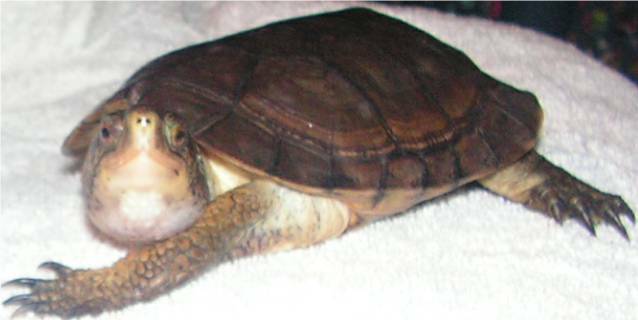 Red-bellied turtles grow 10 to 15 inches long. Here are some links about red-bellied turtles. 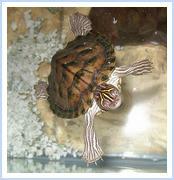 A few photos of baby red-bellied turtles can be found on my baby turtle photo page. 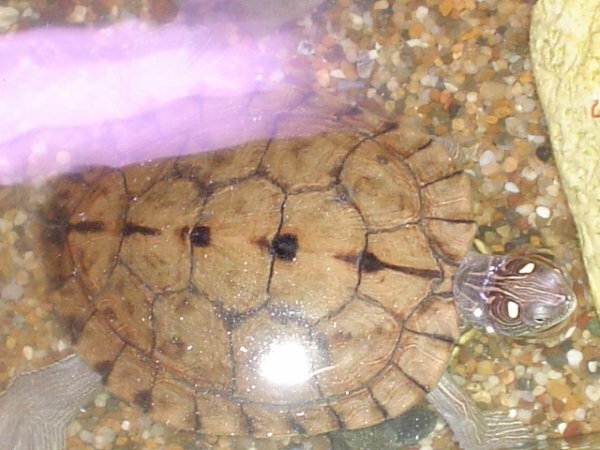 I have a red-bellied turtle. You can read about Tator on Tator's Page. 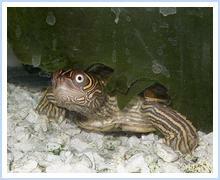 Scot sent some photos of his sick red-bellied turtle on 9/10/06. The turtle seems to have slightly infected eyes and may have an upper respiratory infection. The turtle was not eating and spent all her time on land. The photos are not that clear but I think it is a female. 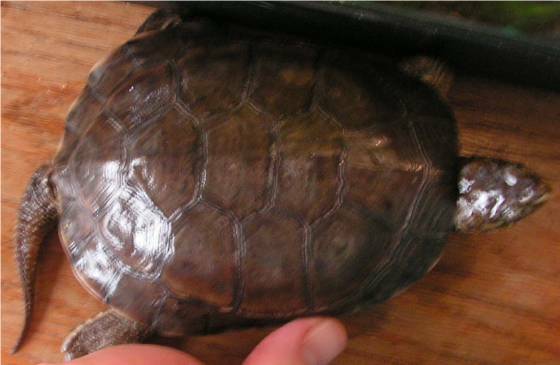 On 4/15/05, Susan sent me some photos of a turtle for identification. 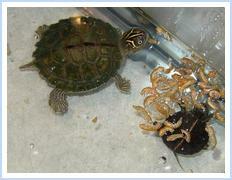 I added them here on 2/17/07 after seeing them again and realizing the turtle was a red-bellied turtle like my Tator. I contacted her. Unfortunately, the turtle has since died but her photos will live on. 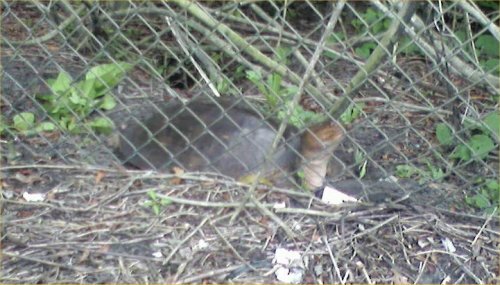 Above is a Florida softshell turtle ( Apalone ferox ) that Tom sent to me in June of 2004 for identification. Since it was in his yard, it is probably a female. This is one big turtle! Just like a snapping turtle, it will happily eat fish, frogs, etc.. It is NOT a good choice for an ornamental fish pond! Native to Florida, the Florida softshell like other softshells has a soft, leather-like shell. Its neck is like a snake. Its nose has a piggy snorkel on it. They like to bury into the sand. 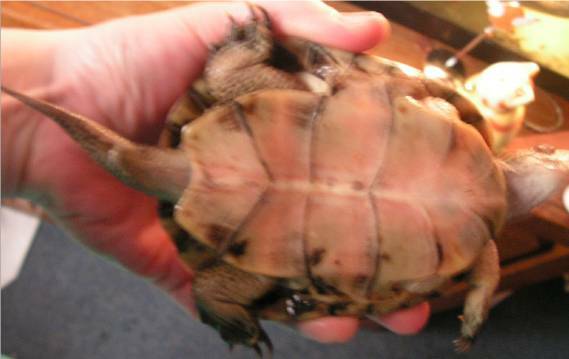 The spiny softshell grows to about a foot long. Others species often grow larger. Unfortunately for them, they are commonly sold live in awful conditions to be eaten in Oriental markets in the US. 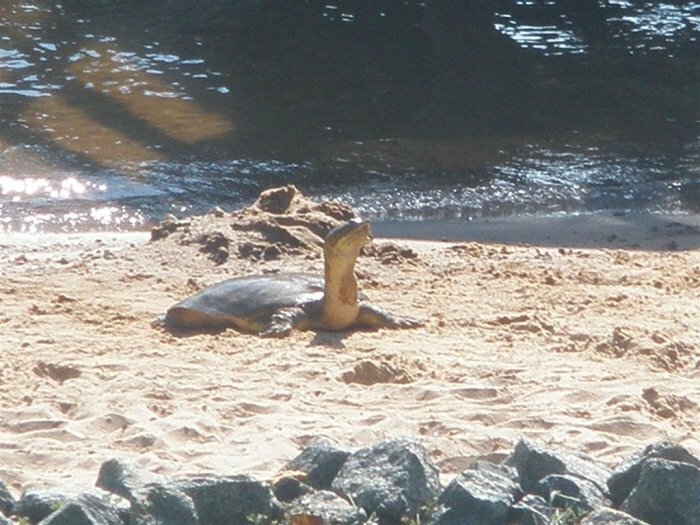 Here is the enature site on softshell turtles. On the baby photo page are four photos of one baby softshell turtle and five photos of softshell turtles hatching and just hatched. 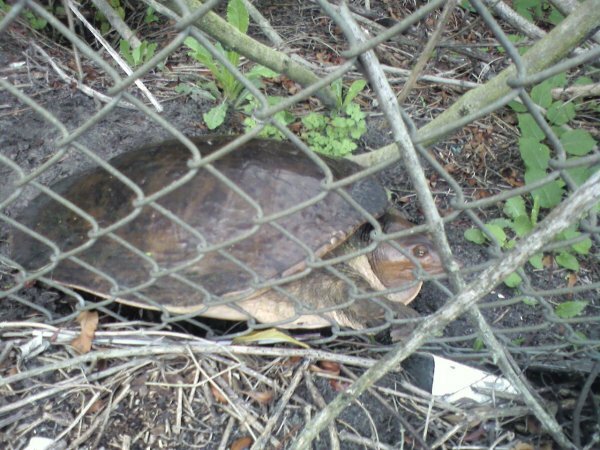 Lehi sent these photos on 5/22/09 of a large Florida softshell turtle against a fence. It was probably an adult female. 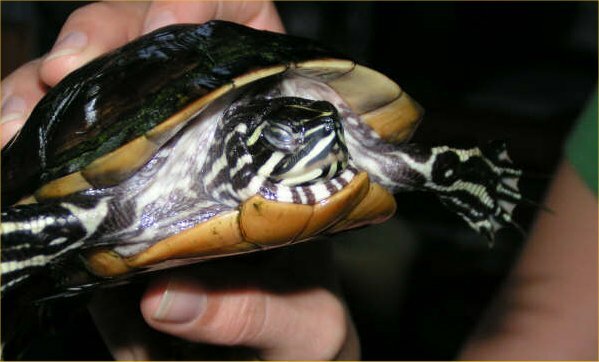 Clemmys guttata is the increasingly rare spotted turtle. They eat insects and small animals. They are gorgeous, small black turtles with yellow spots. 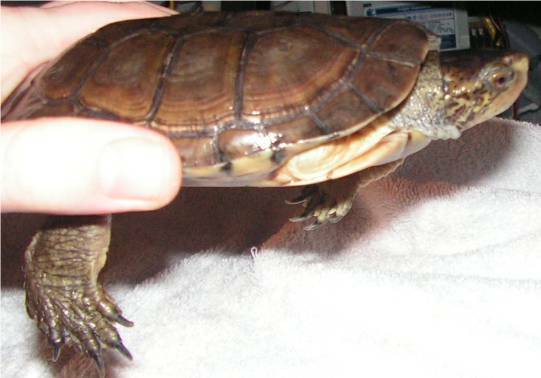 These diminutive turtles only grow 3 to 5 inches long. 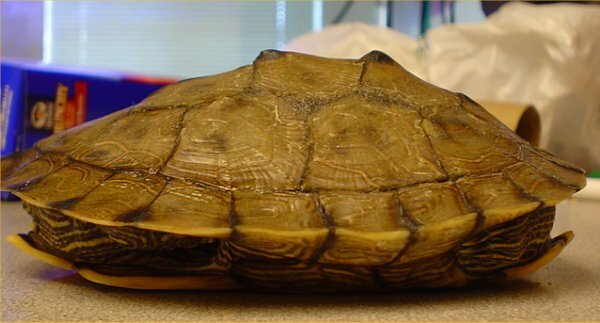 Newborns have one yellow spot per carapace plate while adults have more than one spot per plate. Some dealers may sell them for about $100 a pair! Males have brown eyes and a tan chin while females have orange eyes and a yellow chin. In June, females lay 3-5 eggs which hatch in the early fall. They would be great in ponds except they are too rare to risk their lives outside without complete protection from predators and the elements. If one or more just shows up at your pond, you are lucky indeed. They are know for their mild temperament. 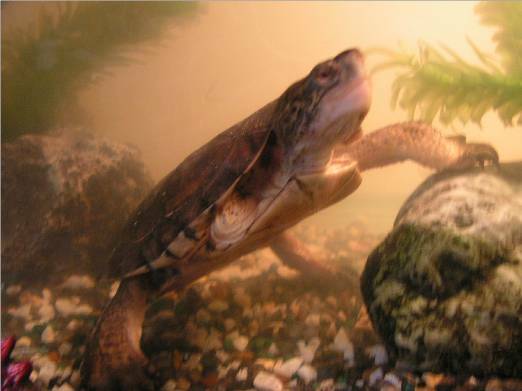 Michael sent this photo of a Western pond turtle on 1/18/06. There are some more below. 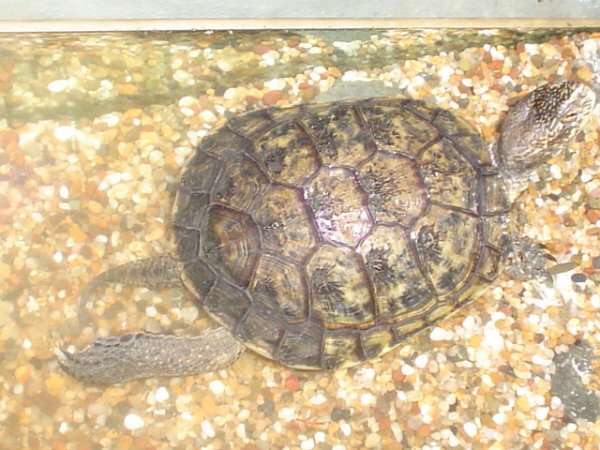 A few times, I have gotten photos for identification of a very plain, brown aquatic turtle. It was the Western pond turtle, Clemmys marmorata . They are fairly common in the far West of the USA, mostly California. Justin sent these photos on 1/2/07 for identification. I think it is a Western pond turtle. 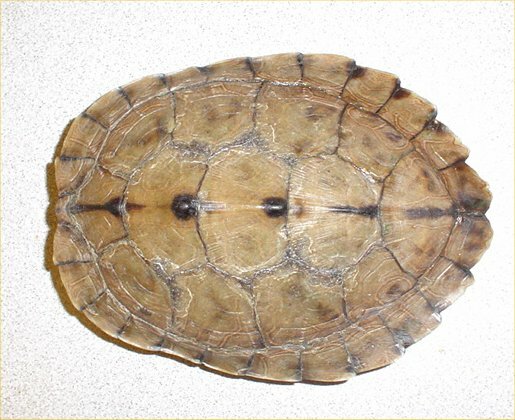 Western pond turtle - top view. Western pond turtle - side view. 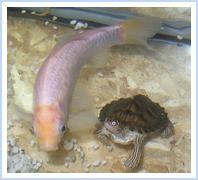 The smaller turtle on the right is a map turtle (see under that section for photos he sent of it at the same time). Michael sent these photos of a Western pond turtle on 1/18/06. 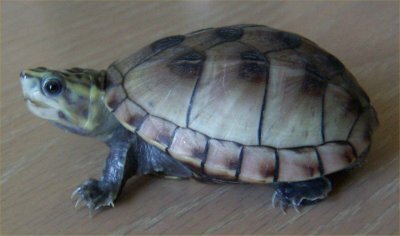 Clemmys insculpta , the wood turtle, is a rare turtle. The wood turtle only lives near water from late Fall to early Spring. The rest of the year, it lives in the woods where it can even climb trees. They eat moss grass, berries, insects, worms, slugs, tadpoles, and other small plants and animals. Wood turtles are fairly large, 5 to 9 inches carapace length. Wood turtles are good climbers.